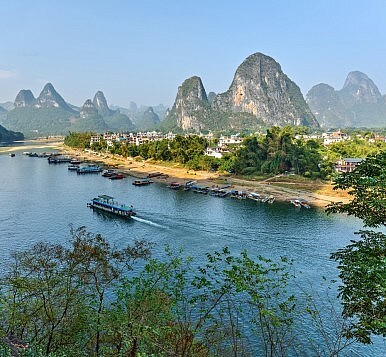 China wants to preserve its scenery (like this scene from the Li River) for future generations. China wants local officials to stop ignoring the environment in favor of the economy. The reforms address many of the country’s major environmental issues. Proposals cover protection of natural resource rights; establishment of a national parks system; better and stricter systems for protection of arable land and water resources management; establishment of a green financing system; and improvement of environmental compensation mechanisms. Twelve departments of both the Central Committee and the State Council contributed to the initiative. Given the numerous interests involved, the Central Leading Group on Financial and Economic Affairs, which had no direct stake in the proposals, led the process. The “ecological civilization” concept first appeared in 2007, in a report to the 17th National People’s Congress. At the Third Plenary Session of the 18th Central Committee in 2013, Xi stressed that China would implement “ecological civilization reforms” – reforms to reconcile contradictions between economic development and the environment. In April this year, the plan was restated, with the release of a document outlining the acceleration of moves to establish an ecological civilization. Proposals include performing natural resources audits when local officials leave their posts, so as to force officials pay attention to environmental protection while in office, or be held to account when they leave. A pilot scheme will be carried out in five different locations, including Hulunbuir in Inner Mongolia. It is the first time such a trial has been proposed by the central government. It will take place in three stages: a launch this year, expansion next year, then in 2017 full audits in the trial locations, with regular audits starting from 2018. The aim is to get local officials to give greater priority to the environment, compared to the economy. Yang Weimin, deputy head of the Office of the Central Leading Group on Financial and Economic Affairs, explained that the aim of this initiative, apart from proposing ideals to guide future reforms, is to fill gaps in environmental governance systems — for example, the lack of a property rights system for natural resources — and to provide the overarching design for environmental reforms. Sun Xinghua, deputy chair of the China Environmental Sciences Association’s auditing committee, told chinadialogue that “confirmation of property rights for natural resources has never been raised before.” Currently, ownership of natural resources in China is unclear. Clarification of rights and responsibilities will reduce disputes and allow for valuation of natural resources. And valuation will allow the compilation of tables of ‘natural resource debts’, removing a major obstacle to auditing of natural resources when local officials leave their posts. However, implementation will still be difficult. Pan Jiahua expects there to be practical challenges when calculating responsibility for losses to natural resources – for example, both manmade and natural factors affect air quality, making the amount of blame officials should bear difficult to calculate. These issues will have to be addressed during implementation. Nor are there any mature systems in use overseas which China can learn from. Chen Chenzhao, deputy head of the National Audit Office, said that no other countries audit natural resources or environmental protection – and so China needs to discover through experience how to run a combined system. Zhang Chun is an editor in chinadialogue’s Beijing office. What Caused China’s Squeeze on Natural Gas? A program to ban coal heating and switch to gas left households in the cold. What happened?